The goal of AC Transit is to hire the best and most qualified candidates for our positions. Although the Employment Process has many steps which can take some time, the end result is that the best qualified applicants are hired. Employment at AC Transit is a rewarding experience. We serve the public’s interest in providing the best Transit System in the country. We hope that you can come join us in this important mission. Please visit our Current Openings page for a current list of our available employment opportunities. The AC Transit Human Resources Department accepts applications, screens candidates and conducts testing in order to find the best applicants for each job. The information that follows, provide an overview of the hiring process. The Application Screening Process is the first part of the selection process. 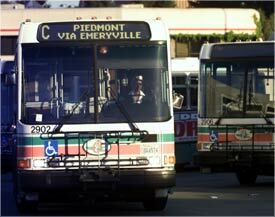 For information regarding how to search and apply for a position at AC Transit, see the ‘FAQs’ page. The District often gives job-related written or oral employment tests as well as interviews to determine which applicants have the best knowledge, skills, and abilities for the job that is open. Finalists are then processed by Human Resources. Reference checks are completed, any drug testing and medical exams are conducted and any criminal history information is obtained from the State Department of Justice. Offers of employment are contingent on passing these final checks.